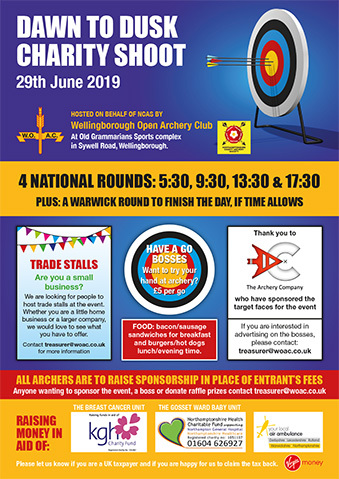 News and information in connection with East Midland Archery Society. The results are available from the EMAS 8th Senior Inter-Counties Team AGB Metric Clout Tournament 2018, hosted by Kettering Archers on Sunday 25th March 2018. EMAS have issued it’s selection criteria for seniors looking to represent the region in the match against the West Midlands later in the summer. Archers are required to submit two scores from any of the following shoots. The handical system will be used to level them up. Targetcraft Archers are to host the EMAS Youth Squad & Open Worls Record Status WA720 Tournament on Sunday 9th April 2017. Rounds: WA70, WA60 & WA50 (for Compounds) in morning with Head to Head’s in afternoon. Subject to demand & if space permits – Metric 122-40, Compound Metric 80-40 both UK Record Status. Other 720 Metric distances will be considered. Please contact the organiser before booking places.